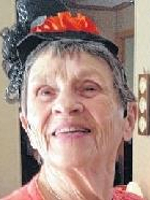 ALBANY – Therese Hough, 83, entered into eternal rest, Friday, July 20, 2018, surrounded by her loving family to be reunited with her Heavenly Father. Mrs. Hough was born in Tupper Lake, the beloved daughter of Edna Gauthier. She attended Holy Ghost Academy, class of ’52. Therese later moved to Albany where she raised her family. Therese cherished spending time with her family and friends. She also volunteered her time at the Ronald McDonald House and was a eucharistic minister at St. Teresa of Availa Parish. Therese worked at Albany Medical Center Hospital for 10 years, but later retired from Verizon after 24 years of service. She is survived by her children, who made her so happy and proud: Cindy (Robert) Monaghan, Tracey Sullivan, Jeffery, Michael (Carol), and Douglass (Paula) Hough; and her grandchildren, Daniel and Emily Monaghan, Nicole and Samantha Shaw, Kelly Sullivan, Anthony and James Hough and Laura and Mark Hough. Special thanks to all the wonderful staff on Unit D4 at Albany Medical Center for the loving, compassionate care that was provided during her stay. Funeral services will be held at the Hans Funeral Home, 1088 Western Ave., Albany, on Tuesday at 8:15 a.m. and 9 a.m. at All Saints Catholic Church, 16 Homestead St., Albany. Relatives and friends are invited, and may call at the funeral home on Monday from 4-7 p.m. Interment will be in St. Agnes Cemetery, Menands. Those who wish may make memorial contributions to Covenant House of NYC, 460 West 41st St., New York, NY 10036-6801. To leave a message of condolence for the family or obtain directions to the funeral home, please visit www.HansFuneralHome.com. We were saddened to hear of the loss of your mom. You often shared funny stories of her I felt like I knew her. You took very good care of her and I am sure she was comforted by your love and care. She is at peace now please take solace in that. She will always be with you- I pray for peace to you and your wonderful family.